One is the first official release from Psychonauticmindlab, an artist collective and label with members from Switzerland, Germany, Bali, Malaysia, Singapore, Taiwan, Russia, India, Nepal, Italy, Korea, Japan, Greece, and Thailand. The name was born in 1992 and has served throughout this time as an umbrella term for various activities within the scene ranging from party promotion, DJing, visual arts, animations, writing, and electronic music production in the fields of psychedelic trance and downtempo. 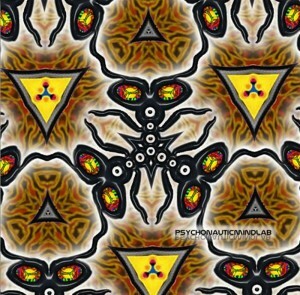 Psychonauticmindlab is a promotion platform for independent artists and events featuring many underground acts, organizations, and festivals. The original cover design for this release is by Thai artist Kongkiat Onboonmee and has been transformed and altered by Leniad Elidan. Mastering on tracks 3 and 4 by Suntekk Mastering, all others by DJ Sanuk at Psychonauticmindlab. MP3 Download | FLAC Download | WAV Download · Download count: 5,361. No comments yet for this nice release ? Nice debut by psychonauticmindlab , very diverse in sounds and atmosphere. I’m liking this one, Especially “Osphorus – Junk Project” .. It’s an acid bomb !! Thats it . . . :D! I think a bit more Forest or Darkpsy-Drive.